I think that’s nonsense it reached almost 20C in Northolt on Saturday with much less inspiring warm air advection for warmth compared to later this week. It will reach at least 25-26C very warm mid week in London area with unbroken sunshine the temperature will shoot up with ease. Warmest weather in the east and southeast, standard stuff. Urban areas warm up quickly and retain ‘heat’ much better than rural green areas, night temps will be notably warmer. Very unusual summer warmth to come for some. Where exactly are you getting 23c as a max from?? BBC are forecasting 26c on Thursday at 3 days away, you think they are going to be that wrong?? I'd say GFS is overdoing it too on maxima. Predicted temperature? Wrong. It started off with predicted highs of 23C on beeb then to 25C now 26C. GFS is notorious for being 1-2C under with warm weather, it consistently under-does it years of experience. It upgrading the temps I’d say are more in line with the actual outcome. 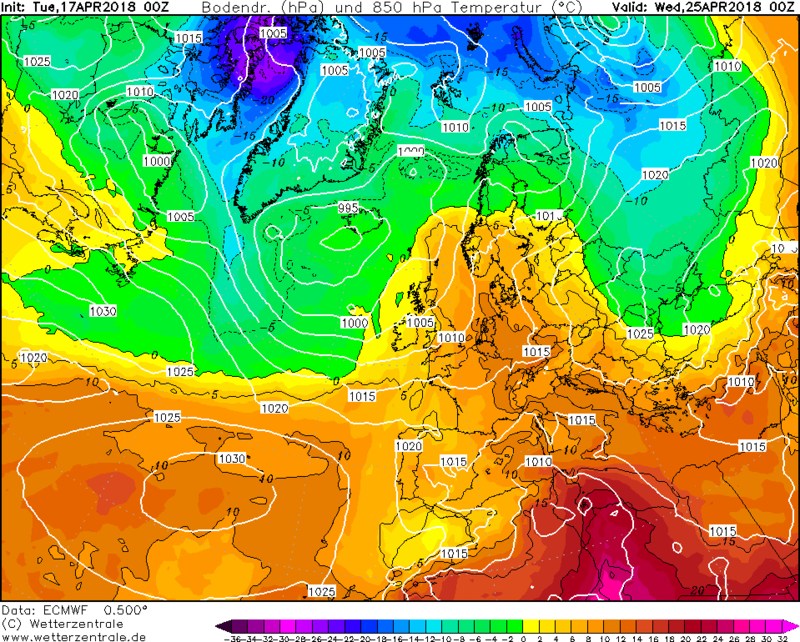 I would say Wednesday maximum 25°C somewhere with foehn influences such as Crosby, Valley, Porthmadog,, Hawarden. Thursday27°C somewhere in the Greater London area. I'd be very surprised (although pleasantly so) if places in NW England got that high on Wednesday. The BBC has places further west in NW England such as Chester and Crosby down as being a couple of degrees cooler than the eastern parts such as Manchester at the moment. There is going to be too much of a westerly component the further west you go I fear. 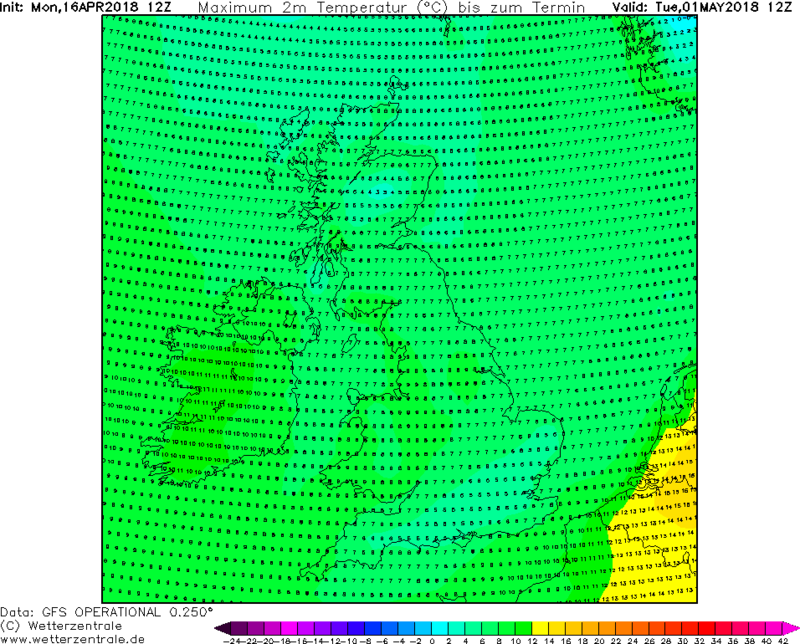 Any influence of air from the Irish Sea is going to ruin hopes of the mid 20s. Hope I'm wrong of course- the BBC seem to think there will be a lot of cloud around until the afternoon too. Shame really as the charts were spectacular a few days ago- and would have easily produced temps in the mid 20s across the region. The GFS overcooking maxima? I don't think so- it's only going for 21C in these parts on Wednesday and 22C on Thursday- very achievable in the setup shown on the 12Z. The 850 hPa temps are certainly lower than was being shown a few days back, but back then the GFS was showing 25C quite widely. It has adjusted accordingly since. Looking at the fax charts the end of the week is not looking as good as it was a couple of days ago..certainly for my location on the west coast there is far more cloud forecast, especially in the mornings, then we have a week cold front moving east on thursday with temperatures only forecast to reach 13c on Friday courtesy of a westerly breeze. Warming up a little for the weekend before it goes down hill from Sunday. Earlier in the week the high was forecast to be stronger with a continental feed. So by common agreement we have a warm spell arriving. Do we bask in this prediction? Not some of you just arguing will it be 21 C 23 C or 25 C. For gawds sake stop bickering and enjoy the summer like weather for many areas for 2-3 days. I was just think the same. Who cares anything above 20c is very much welcome even here on the south coast. whichis to be expected with enso neutral low solar activity amongst other things. It wouldn't surprise me if this summer turns out pretty good. But for now we have some fantastic weather to enjoy. With temperatures possibly reaching 25c or maybe bit higher. Where is this westerly component you speak of? Barely any.. if you looked at the charts. 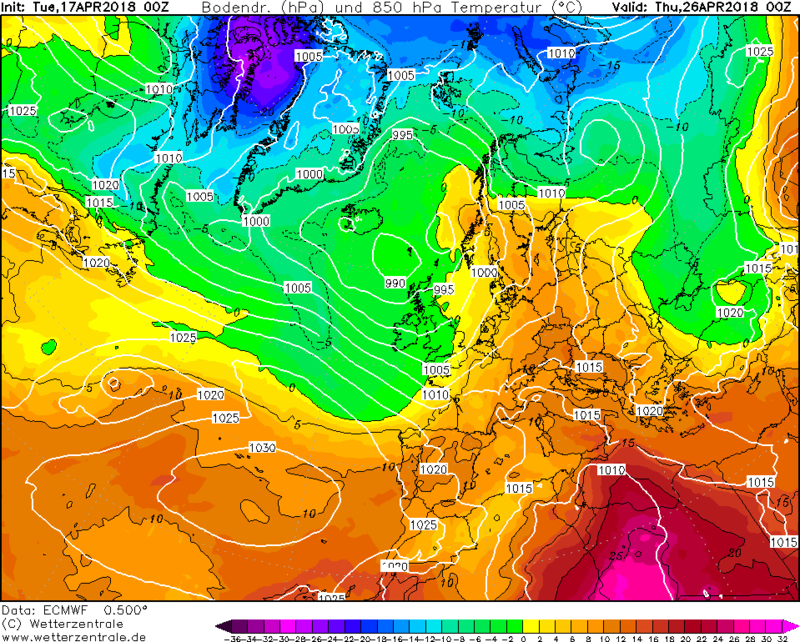 I see it’s not looking as warm for the far NW more of Atlantic influence (scotland) but elsewhere that’s not true. From Thursday yes but Wednesday looks like an off-shore wind throughout. living here I know the signs to look for and from them I see a high likelihood somewhere in NW England/N Wales will at least be in the top 10 warmest. Let’s see. After Thursday though yes it has downgraded a lot for up here. In terms of the overall upper pattern there seems little expectation of ridging keeping settled weather beyond this coming weekend. By then a generally westerly pattern is showing on the 3 main anaomly charts. A north to south type of split in terms of more or less settled on a very broad scale description. Sorry but these charts seem to be full of false promise. A slight raise from 9C to 13C over the last 4 days might show red on mean charts, but intermittent rain and low eastern clouds aren't my idea of early Summer. So please keep it real when posting average charts without actual weather musings. 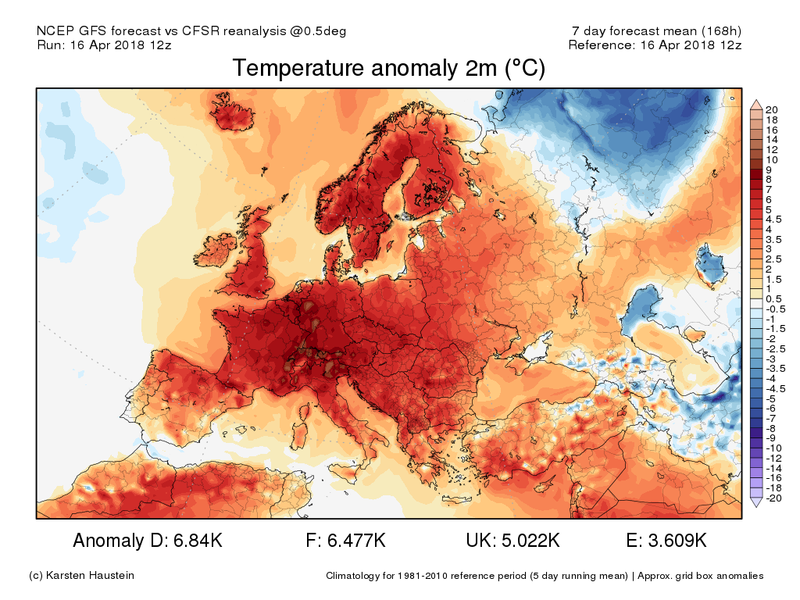 Quoting comparable April warmth and red charts dont necessarily equate to factor 30 weather, I think we're a few months early for those warnings, so please keep it real. Charts showing oranges/reds in the late Spring are different to Blues and purples, as the former guarantee snow, whereas the latter just means cold or not so cold rain most of the time. I think you are mis-interpreting the charts? If it was showing 9 to 13c it would be blue, as these are anomalies relative to the average for the date period. As we are in mid to late April, the daily average is around 12c (16c max/8c min), so the reds indicate roughly 5c above the mean for the period shown, which is what we are about to get. Also, the sun is as strong now as it is in August, so 25c with strong sunshine will feel warm, and with a high risk of burning. If it was showing 9 to 13c it would be blue, as these are anomalies relative to the average for the date period. As we are in mid to late April, the average is around 15c, so the reds indicate roughly 5c above the mean for the period shown, which is what we are about to get. Sorry, but I think your misinterpreting my post. 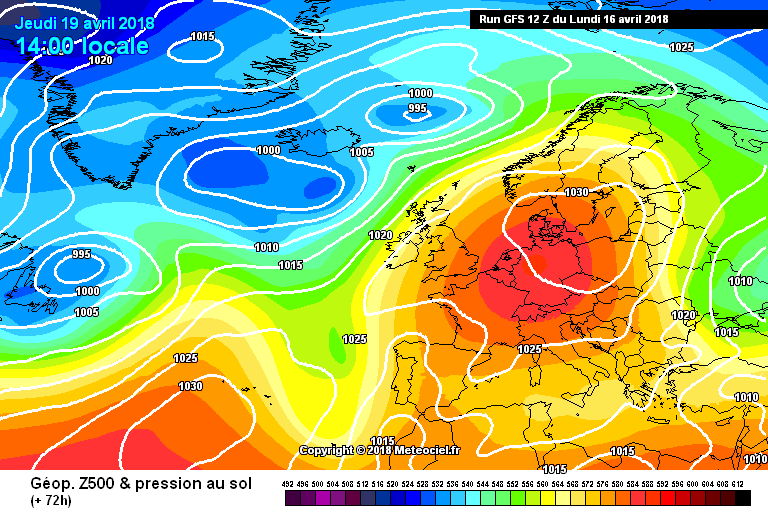 As what I was trying to say is reds on these type of charts don't mean Sun or early Summer. I was sunburnt 2 weeks ago in the Spring Sun after 1hr on blue charts, but let's not oversell red charts. The last few days where I am in the east have remained cold in the rain yet charts posted a few days ago showed red, a bit of a mis match. I just think there is too much premise put on average temperature charts, with an agenda, without any mention whatsoever of actual weather which in reality pulls temps down. While some quibble over whether it'll be 22, 23, 25 or 27c on Thursday (and for those of us stuck in an office and unable to take part in the seemingly obligatory BBQ it's immaterial) the weather moves on its merry way oblivious to our wants, needs, hopes and desires. 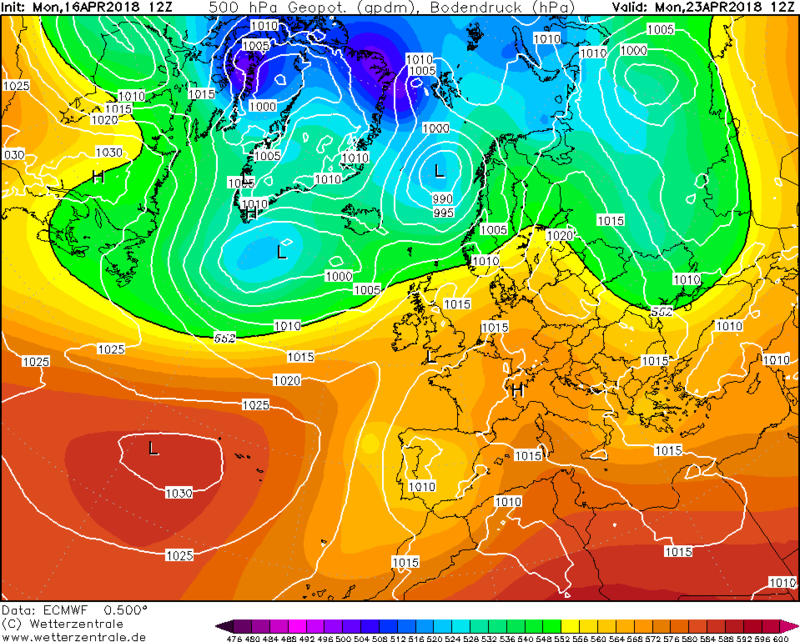 To be fair, ECM keeps the fine spell going through the weekend and into next week by a new push of heights to the north and then the east of the British isles but the break down is only postponed and by T+240 a fresh W'ly regime is in place with LP to the north and HP to the south west so always drier and warmer to the south with rain or showers further north. 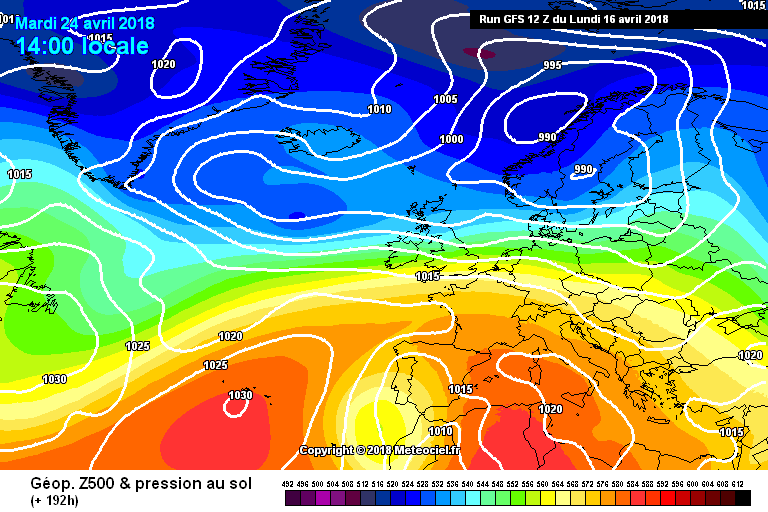 GEM breaks down the fine spell much more quickly than ECM (it's gone by Monday on the former) and from then on it's a WNW'ly with broad if reasonably shallow areas of LP on a slight negative tilt moving from the area south of Iceland crossing Scotland and into Europe. HP is suppressed to the south so it's a cool and changeable outlook with periods of rain or showers for many but the rain always lighter to the south.  Slightly different but the overall evolution is similar to GEM. The fine spell is replaced over the weekend by a cooler W'ly form and there's a NW'ly by T+240 as the trough migrates to Scandinavia pulling in cooler air. Signs perhaps of a pressure rise in mid Atlantic behind and while it doesn't happen at once the Greenland HP re-asserts and the trough sinks close to the British Isles further into FI. The resulting air flow is sourced from Scandinavia so won't be warm. Very unsettled with rain or showers for most. Further into FI, a ridge builds north from the Azores and across northern Britain into Scandinavia bringing a return of some warmer air. The 850s tell a clear tail with most having negative values across the British Isles by this time. The OP representative of the suite in my view with the majority suggesting a cool NW'ly flow - one or two go further and have a N'ly. Only a couple of members keep a warmer S'ly component by this time so it looks all over for the fine spell by this time. 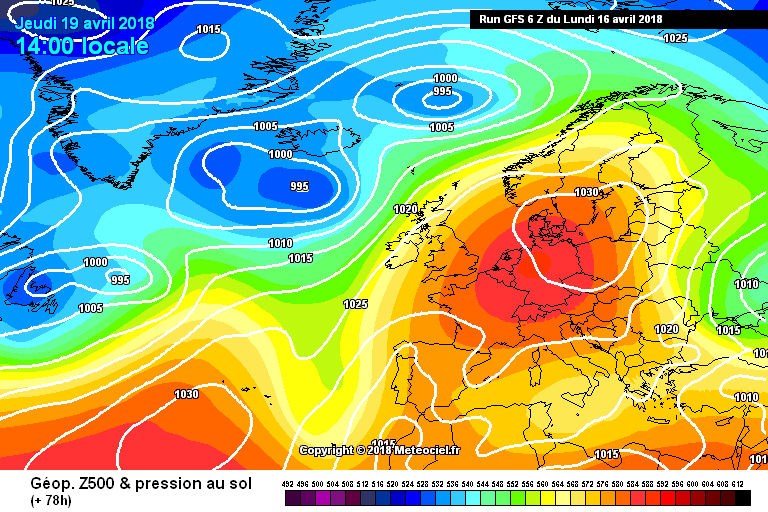 Further into FI and easterlies are appearing as is the Greenland HP but that's by no means a done deal by this time. 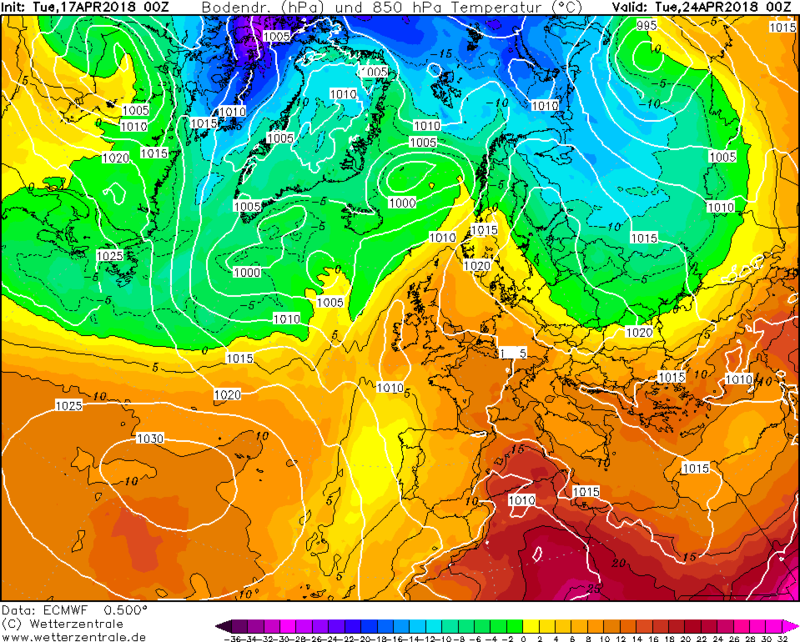 We often see a colder interlude in late April or early May and this year looks set to be no exception. 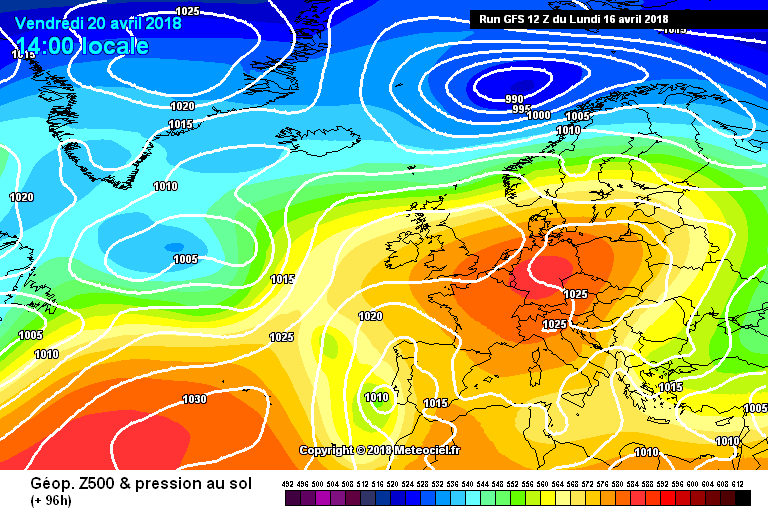 In summary, some fine warm and sunny days in the near future but the breakdown is clear and into next week it looks like a deteriorating situation with more changeable and cooler conditions encroaching from the north and west. 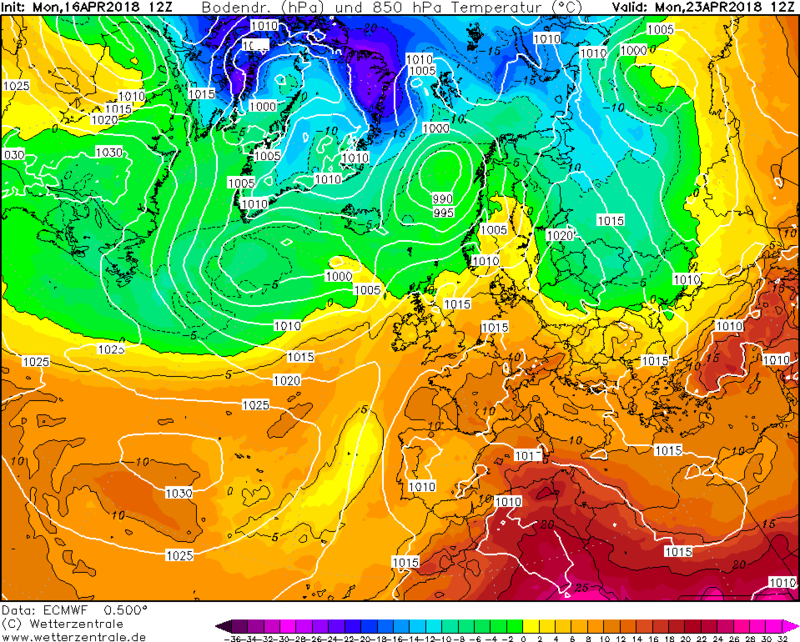 From there, it's still unclear but the end of April and beginning of May are often colder and more unsettled and this may again be the case with the possibility of the Greenland HP building down and introducing something more N'ly in nature. As ever, more runs are needed. Disclaimer: this is the gospel according to the GFS and is not written in stone!